The Polaris Slingshot is sometimes called a three-wheeled motorcycle or a reverse trike, as its design places two wheels up front and one in the rear. Driving a Slingshot is an experience in itself, but driving a Slingshot over the scenic mountain roads near Vail, Colorado, is an unforgettable adventure. Here at Rocky Mountain Adventure Rentals (RMAR), we offer Polaris Slingshot rentals so that you can get the thrill of being behind the wheel in this vehicle that has an incredibly unique design. 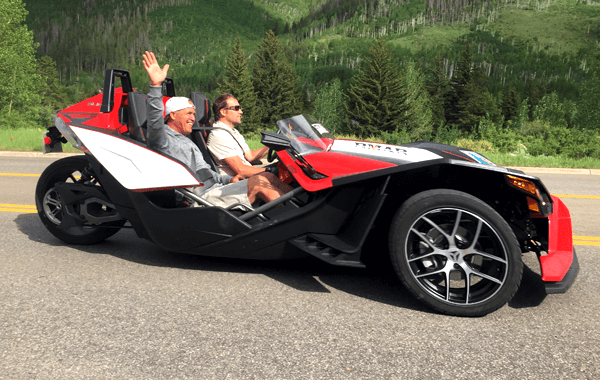 Updated Colorado laws make driving the Polaris Slingshot even more accessible, so read on to find out more about the Slingshot driving experience and about where to drive a Slingshot near Vail. Great news: As of April 2017, Colorado no longer requires a motorcycle endorsement to drive a Slingshot. Now anyone who meets the legal requirements for driving a car can also drive a Slingshot. This change makes Slingshot driving more accessible for a wider group of people who want to give it a try on exciting mountain roads near Vail with Slingshot rentals from RMAR. A bit of background: When Polaris introduced the Slingshot in 2014, drivers were required to have a motorcycle endorsement or license to operate the Slingshot. Because the Slingshot has three wheels, some states have chosen to continue requiring a motorcycle endorsement. But many states are now choosing to license the Slingshot as a car because it handles more like a car than a motorcycle. Colorado originally required drivers to have a motorcycle endorsement in order to drive a Slingshot, but as of April 2017, Colorado drivers only need a driver’s license to take a Slingshot out on the open road. In Colorado, drivers and passengers under the age of 18 are still required to wear a helmet when in a Slingshot, in accordance with Colorado’s motorcycle helmet law. Drivers and passengers over the age of 18 are not required to wear helmets when in a Slingshot—though RMAR has helmets available for those who would like to wear them. The Polaris Slingshot is known for its low-to-the-ground ride and for its powerful acceleration. It also features a side-by-side, driver-passenger experience and an open cockpit that doesn’t have any doors. When driving a Slingshot on the mountain passes and rolling terrain near Vail, this set-up lets drivers and passengers take in cinematic mountain views and breathe in refreshing high-country air. The Polaris Slingshot is also an ace vehicle for driving on winding mountain roads. Because it’s lightweight but doesn’t have overwhelming power, it accelerates nicely through corners and curves. The Slingshot’s body shape gives drivers and passengers the sense of being safe and enclosed while also being incredibly low to the ground. Now that Slingshot driving is even more accessible to Colorado drivers, we’re excited to share the experience by offering Vail Slingshot rentals. It’s possible to drive a Slingshot right out the RMAR adventure rental location in Eagle-Vail and have the day trip of a lifetime. Summit County Driving Tour: This driving tour goes through Colorado’s Eagle, Lake, and Summit Counties, and it shows off the best of Summit County’s scenic terrain with views of Lake Dillon, several of Colorado’s fourteeners, and a good balance of less-traveled mountain roads and popular destinations. Fun, turn-heavy roads offer incredible appeal for Slingshot drivers who want to know what this vehicle’s cornering and acceleration is all about. Independence Pass Driving Tour: The Indy Pass Loop showcases Colorado history and classic mountain roads. Colorado’s Independence Pass is only open during the summer season, and this iconic loop winds through scenic mountain terrain and goes up and over several mountain passes. The towns of Leadville, Aspen, and Glenwood Springs are among Colorado’s not-to-miss summer destinations, and it’s possible to visit all three in a day with this adventurous itinerary. The Independence Pass driving tour is epic, simply put, and Slingshot drivers will revel in this experience for years to come. Ready to go? Find out more here: Slingshot rentals from Rocky Mountain Adventure Rentals. Or give us a call today to reserve: (970) 471-8491. Drivers must be 16 with approved endorsements. Under 18 must have drivers license present upon rental. Credit Card and Deposit will be taken upon reservation.